"Documents the stunning accomplishments of Disney's imaginative genius. It is not a flattering portrait." It always amazes me how rabidly people will guard their heroes, to the point where they'll believe the person actually walked on water. And the moment anyone debunks that myth, they chop their heads off over it. Such is the case with Disney, whose story was carefully crafted and guarded by publicity and a powerful corporation. Just like Lana Turner was not really discovered sipping a soda at the corner malt shop and Rock Hudson was not really in love with Doris Day, Walt Disney was also flawed, like the rest of us. I am also amused by how people will run with their 'facts' and quickly say the author didn't know diddly, just because he or she may have dared to touch their 'hero'. I am so happy (and quite envious, in fact) to know those who commented so in here actually KNEW Disney personally. Wow! The fact is that unless you knew him personally, or actually spoke to people who did (and who would actually dare speak out), you, like me, are not qualified to say 'yay' or 'nay' about this author's work, just because he may be writing things about Disney that you may not want to hear. Personally, based on much of my fascination with Walt Disney that I have had since I was a child, and countless books and research about him that I have done, I find this book to be wonderfully written, depicting Disney as a person like the rest of us, who happened to have a will of steel, but nonetheless was flawed by his belief and trust in others, perfectionism, depression and compulsiveness. Mind you, this book is not the first time I hear this about Walt Disney, but after reading this work you truly get to admire Disney even more for accomplishing all he did when many would have given up. Also, contrary to what some people comment in here, the author does indeed acknowledge a vast amount of sources, many disclosed, many private. I have personally known people who worked for the Disney company and that some sources wished to remain anonymous does not surprise me in the least. I truly recommend this read, but only if you can open your mind to discover more depth about someone you may idolize. Disney was not just a nicely designed signature, he was a REAL person. The moment some of you can accept that will be the moment you can idolize him - not a myth - even more. Mosley presents Walt Disney's life story in a fair, human (foibles and all) account of the man behind the corporate icon. Filled with detailed personal accounts of Walt's involvement with various productions. I have no problem with this "unofficial" biography, one which portrays a less-than-stellar account of Disney's attitudes, while giving full credit for his creative achievements, but I tend to question Mosley's tendency to parphrase conversations and qoute them as verbatim. More explicit citings of his sources (who told him what stories) would lend more credence to Mosley's "story-telling" narrative. 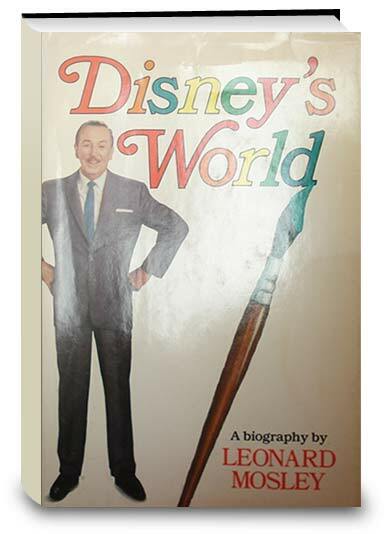 Click the button below to add the Disney's World: A Biography to your wish list.